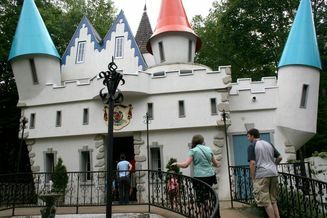 A trip to the White Mountains of NH is not complete without a visit to Story Land, a children's theme park that has entertained families for over 60 years. Ride the Roar-o-Saurus, visit with Cinderella, take a ride on the Buccaneer Pirate Ship, cool off with Dr. Geyser's Remarkable Raft Ride and so much more. There is something for everyone in your family to enjoy! Located just a short 15 minute drive from the Green Granite Inn, our Story Land hotel package includes overnight accommodations, tickets to Story Land, a deluxe continental breakfast and full use of Green Granite's amenities including our indoor and outdoor pool and playground. Call the Green Granite Inn today at (800) 468-3666 to book your perfect summer North Conway getaway!